Achieving longer lasting eyelash extensions is not solely based on a Lash Stylist’s technique or the eyelash extension adhesive (glue) that was used. It’s also about at-home care. In addition to using a compatible lash extension makeup removing cleanser and lash extension compatible cosmetics, one key aftercare step is also very important: Protection! Xtreme Lashes CEO, Co-Founder, and President, Jo Mousselli, discovered that by protecting the attachment area between the eyelash extension and natural eyelash from mechanical and chemical environmental stressors including water, humidity, tears, oils, sweat, makeup, dust, and debris, longer lasting lashes can be achieved. 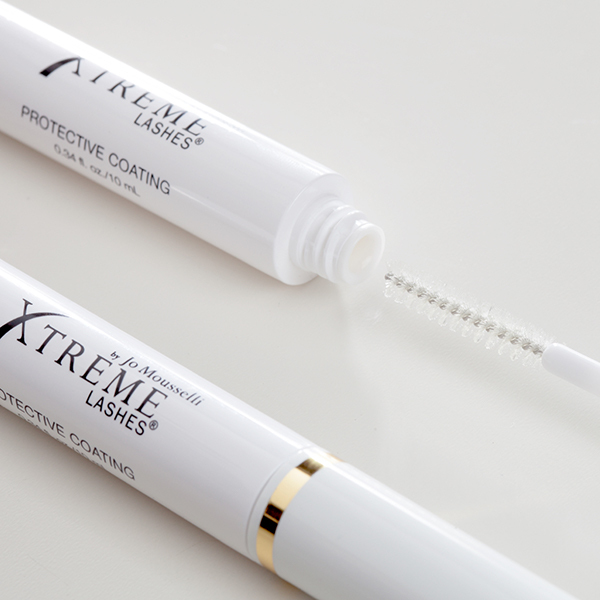 From that scientific discovery, Xtreme Lashes® Protective Coating, an innovative eyelash extension sealer, was developed. Protective Coating was designed for every eyelash extension wearer. However, those who subject themselves to excessive water, sweat, steam, and humidity need to use it because they are more prone to losing eyelash extensions faster compared to those who do not subject themselves to these environmental or lifestyle factors due to hydrolysis. Hydrolysis is the chemical breakdown of a compound due to reaction with water. Simply put, water destroys the cyanoacrylate eyelash extensions adhesive bond. And, the eyelash extensions adhesive (glue) is susceptible to destruction from water. So, athletes who participate in sports such as swimming, hot yoga, and heavy aerobics such as running, or cycling are the most susceptible. If you participate in strenuous exercise or activities that induce a lot of sweating, extra care is needed and increasing application to 3 times per week is suggested. Jo recommends applying Protective Coating to freshly cleansed lashes and prior to heavy exercising. Doing so helps provide protection, while preventing product build-up. “View Protective Coating as an armor against environmental factors!” says Jo. Now that you know how to better protect and care for eyelash extensions, Jo’s last and final tip is to remember the date of your upcoming Relash™ (lash refill) appointment.